Like many boaters, I’m always on the lookout for the right next boat. Since joining Panbo I’ve written somewhat frequently about my recently completed trip around America’s Great Loop. That trip provided my family and me with an amazing adventure as well as the opportunity to think about what makes the right boat for us. We currently own a 2003 Carver Voyager 570 named Have Another Day. We bought Have Another Day with no plans for extensive travel and extended time living onboard. It was a logical next boat for us in our Lake Michigan boating career. Then, the opportunity came to step away from our traditional lives of work and school to travel. We debated selling Have Another Day and buying something more blue-water capable, but after considering the route the Great Loop takes we decided the boat we had was fine (if a little big). Have Another Day completed the Loop very well: she was extremely comfortable for all four of us and our frequent guests, she was reliable, and with the addition of the Seakeeper and the ability to run at 9kts, she was pretty darn fuel efficient for a nearly 60′ 60,000 pound boat. As those who have read my blog may already know, my propeller budget was stretched on our trip. Our boat draws right around 5′ with the propellers extending a full 20 inches below the next lowest part of the boat. There’s no keel on the boat and the next deepest portion of the boat is very far aft. All this adds up to little margin for error in shallow waters. Any incident is likely to end with a haulout or a diver and a prop-shop. So, the first requirement for our next boat is a keel that extends lower than the props. It doesn’t have to have skegs below the props, though I certainly wouldn’t turn that configuration down. We have aspirations of cruising much further south into the islands than the Abacos chain of the Bahamas we visited last year. My eventual aspirations include making our way all the way down the Caribbean, to South America and through the Panama Canal. On the west coast I’d love to explore Costa Rica, the Baja Peninsula, the Pacific Northwest and Alaska. Our next boat will be selected with an eye towards that cruising. 2 heads minimum — it’s me and three women, need I say more? We’ve looked at a LOT of boats. We got very close to a deal on a mid-2000s DeFever 56′ that we really liked but turned out to have an engine package poorly matched for the hull resulting in pretty poor fuel economy. We’ve looked very hard at Grand Alaskans (also an Art DeFever design) and gotten close to a deal on a 65′ flushdeck. 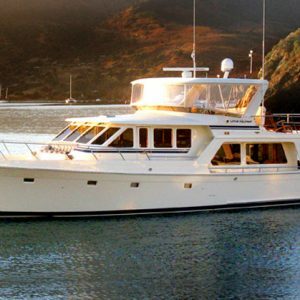 We ultimately decided that boat is a little larger than we really want to take on (more issues of overall size than LOA) but still think that the 64 raised pilothouse Grand Alaskans are a good fit for us. Our long list of boats we’ve considered includes Fleming 55s (a little too small), Fleming 58 (perfect size, can I borrow a few million? ), Fleming 65s (great boat, big price tag), Offshores (most don’t have a Portuguese bridge and come at a very high price point), Selenes (still in consideration, on the slower end but doable), Nordhavns (amazing boats, might be overkill for our needs, draft a concern), Grand Banks Aleutians (amazing boats, might be out of our price range), Outer Reef (another price point challenge) and probably many others I’m forgetting. 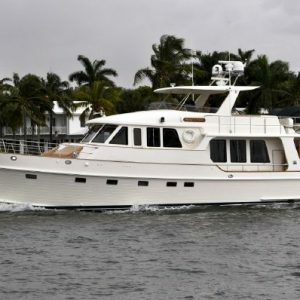 We’ve looked at some boats pretty far afield of the mainstream like Florida Bay Coasters, Real Ships and Great Harbour but haven’t yet found something that checks all the boxes for us in that direction either. I believe it’s likely the collective wisdom and experience of this group of boaters is likely to be far exceed my own. So, please, tell me what you think I should be looking at. Am I on the right track? Am I missing something? Ruling out a class of boats I should be considering? I’d love to hear from all of you. The next Gizmo? Talk me down! I’m curious about why you want a Portuguese bridge? Is that about protecting the helm windows in heavy seas? But, sorry, no suggestions here. 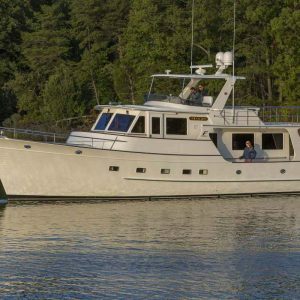 I haven’t shopped in this boat size, though I must say I enjoy seeing a Fleming 55 entering Camden Harbor or out in the wild. Stately. The main reason for the Portuguese bridge is crew safety. Especially if crew happens to be my children; I really like the idea of them being able to get from one side of the boat to the other while staying entirely within the nicely protected walkway of the sidewalks and Portuguese bridge. This is less urgent if the bow is entirely flat as it frequently is on the larger cruising motor-yachts but still not as well protected in my mind as the Portuguese bridge. Incidentally, that’s the first time I’ve seen the acronym stated as Functional Power Boat. I believe that long-time sailor Steve Dashew had something much saltier in mind, though the only confirmation I could ever get from him was a little grin. Ben, take a look at the old Hatteras Long Range Cruisers. A 58 fits all your criteria, I think, except modern diesels (instead you get a pair of bullet-proof Detroit 4-71s). We have an active Club that helps the members keep these great boats in fine form. Check out our web site! We’ve looked at LRCs in photos quite a few times. Thus far our thinking has been that we’d prefer something a little newer with newer systems, interiors, etc. I know some of the LRCs have been beautifully updated so if one came along with updates we liked I’d be very open to it. Wow, I’m surprised that you eliminated the Great Harbour 47’s. As they meet all your requirements albeit without requiring stablizers as are self form stabilized. at a bargain price. 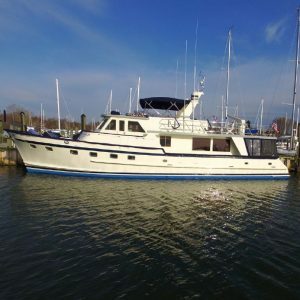 Their tankages is huge as is the interior.. Skeg protected props, shallow 3′ draft, unsinkable hull, huge usable galley with household style and sized appliances. You should look at them. There are several used listed by MIrage. Good Luck. I haven’t eliminated entirely the Great Harbour. I took a look at the two that are on the market now and and didn’t feel like either of them was the right fit. I will admit that coming from way too much power for what we need making the move to two 56hp diesels is a little hard to get my mind around. That’s exacerbated by having watched a GH 37 in a big blow in St Augustine end up sideways across the docks without enough power to maneuver off. You noted attributes for cruising, but not living (other than sleeping and in the galley). What about sitting? Some vessels forget that the captain might want some company. Other vessels think you are going to enjoy a sofa seat for an entire year of Looping. I too am in the hunt for the perfect boat. Have a 60ft SeaRay now and find it hard to beat. It is fast when I want her to be (31kts) and yet I have cruised at 8-10kts for fuel efficiency throughout Mexico and the Sea of Cortez). My wife and I keep going back and forth on replacing Valkyrie for Coastal cruising where larger is even of interest and with something completely different for doing the Loop in the not too distant future. Anita is concerned about comfort (hence the seating discussion) while I look at the mechanics and seaworthiness. Interior comfort is definitely a concern. I was worried that if I listed every criteria nobody would read my 100 page treatise. So, instead I tried to summarize down to some of the biggest issues. 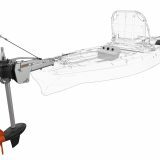 Our Carver currently has an immensely comfortable Flexsteel settee that compares very favorably to most everything we’ve seen on the boats we’ve looked at. Please, keep the suggestions coming.. I’ve already spent some quality time on Yacht World this morning checking out everyone’s suggestions. Have you looked at Tanglewood? Definitely a previous owner you’d want to follow, even if he and the other Ben haven’t seen eye to eye. I should have mentioned in my requirements / desires list that an air draft below 20′ is highly preferable so that I can clear the fixed bridge just west of Chicago. I’ll edit the list. 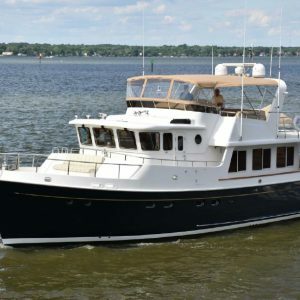 I also fear that a 2014 Nordhavn 60′ is going to be out of my price range. The Flemming and Grand Banks up above are the first boats that came to mind. 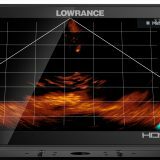 My personal choice in this category is the Nordhaven 62 I love them for some reason. 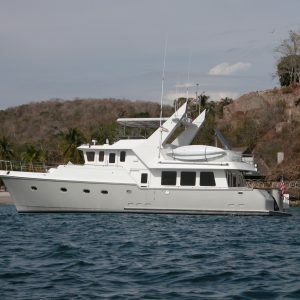 For more the motor yacht side the Pacific Mariner 65 is a great boat. but does not quite hit some things on your list. I also think there may have been some Krogen’s with 3 staterooms but I’m not sure which ones. I suspect that you’re correct about the Portuguese bridge being limiting. I’m a big fan of the N62s as well (and the N63s are pretty spectacular as well) though a lot of the N62s have kind of funky interiors. I’d never sell my wife on a boat with a rubber dot floor in the master stateroom. I have explored PM 65s as well. They’re great boats though as you say don’t hit all the (many) things on my list. Thus far I think everyone has been too kind by not calling me ridiculously picky. I want everything and I’d like it all for bottom dollar. But, I guess I’m willing to wait until I can find the right boat at the right price. I guess the big question is, how long will I wait? The N62 in all honestly would not be the boat I would purchase either if I had the funds (even thou I have loved them since I saw a tiny blurb about it in boating magazine in the early 90’s). If cruising with my wife and 3 kids the Pacific mariner would likely be the choice. I used to have kind of a bad opinion of motor yachts as I get older they honestly appeal more then bluewater boats I would likely never use the capability of. A smaller Marlow (57/58) would fit the bill perfectly but it sounds like they may not fit the budget. 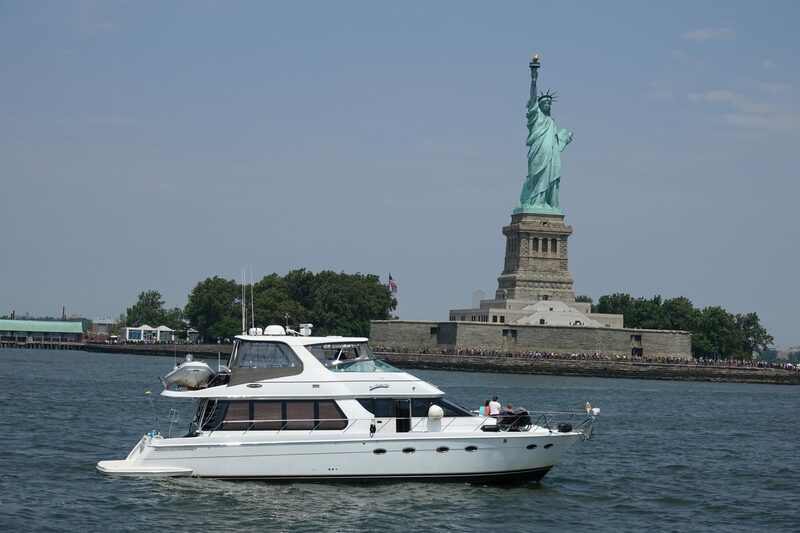 If you look at your list, a GA64 Pilothouse ticks all the boxes. Dont worry about the fitted engines, just dont push them too hard and keep up the maintenance. The good thing about the overpowered ones is that the running gear was normally beefed up to cope so you have no problems there. While they have a semi displacement hull shape they are built so heavy that the only thing that gets on the plane is your fuel flow. They are a classic “constant speed/variable fuel flow” boat. Thanks Paul, you’ve confirmed a lot of my thinking. I like your wisdom about “constant speed / variable fuel flow” and will remember that. Personally, I’m not a fan of Marlows. I’ve heard just enough anecdotal snippets to cause me some concern. You’re also likely right that my enthusiasm is probably moot because of issues of budget. How about a Kadey Krogen 52 twin engine. That fits all the requirements, but not too many configure the 3rd cabin for sleeping, usually office. 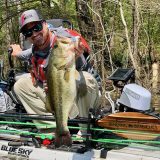 Great boat that seems to meet you requirements, however, budget may be a problem. The Krogen Express meets most criteria too, except they have the turbocharged engines. Nice little (!) boat here next to us in Deltaville – I know it’s been on the market for at least a year. Sure looks attractive, and seems to have all the toys. Might be a bit bigger than what you were looking for, tho.